Who is Barry Allen if he's not the Flash? In Flash Vol. 7: Perfect Storm, writer Joshua Williamson gives a good answer to a specious question; the conclusions Williamson arrives at about Barry Allen, about speedsters, and about the peculiar "Flash family" of the early Rebirth era are all quite heartening, but it comes again at the expense of the Barry Allen character himself. Williamson's Flash is ramping up for its big "Flash War" and I'm eager to see what happens next; I just wish these stories didn't keep coming at the cost of chipping away at the Barry character further. 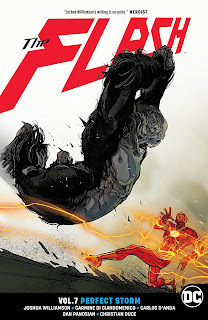 Gorilla Grodd heavily influences Barry Allen's mind in Perfect Storm, and there's a suggestion toward the end that Barry's wholly selfish decision to regain his lost powers while sacrificing Central City was Grodd's doing. Then again, the story also suggests Barry has some real angst about himself sans the Flash -- that Barry isn't so sure he's interesting, lovable, or worthwhile without his speedster powers. Such is the push and pull of Joshua Williamson's Flash. To me, Barry Allen has always been the most stable of DC's hallmark characters -- the least angsty, the most sanguine about his own nerdiness, the one for whom his powers were most just an extension of his own self. Sure, Barry might want to regain his lost powers, but the deals with the devil and general riskiness seems devoutly un-Barry. It is well in line with the Barry of Williamson's run, however, and so I was not exceptionally surprised, nor that Williamson doesn't make a stronger statement in the end as to how much was Grodd and how much was Barry himself. The cards are starting to be laid on the table now, and indeed after Perfect Storm we know two things -- one, that Grodd's been inside Barry's head almost since the beginning of this series, and two, that pre-Flashpoint villain Hunter "Zoom" Zolomon has been behind the scenes. One would hope, and especially with "Flash War" coming up, that we're about at the point where Williamson will pull back the curtain and reveal that all of Barry's bad behavior over almost fifty issues is because of one or the other; we did not get a strong statement that it was Grodd, so Zoom remains the last, best possibility. To go on for more than fifty issues without knowing, for instance, why Barry Allen had a Speed Force-fit and repeated alt-continuity insults back in the ninth issue of the book would push well past waiting too long. And yet, as has been increasingly the case, when we set Barry Allen aside, a lot else about this book sings. Avery Ho, the Flash of China, is a wonderful, bright addition, a character not seen for almost thirty issues but who's been making her name over in New Super-Man. Again, by the end of this book Williamson has created this new, weird "Flash family" made up of two semi-reformed villains, Godspeed August Heart and Negative Flash Meena Dhawan, plus Avery and the past and present Kid Flashes Wally and Wallace West. They are not Impulse, Max Mercury, and Jessie Quick, but there's a similar feel with a modern aesthetic. Even if I decried Barry's weaker moments earlier in the book, I certainly cheered when he attested that the speedsters are "at our fastest ... when we run together" with his new "family" spread out next to him. I appreciate the amount of momentum Williamson imbues this book with, especially at the end. We get the revelation of Hunter Zolomon, of course, but also a strong final issue with cut scenes involving Meena, Godspeed, even a link to Adam Glass's new post-Metal/"No Justice" Teen Titans series. It has taken a while, but Williamson's Flash feels like a book with a lot going on (even if we're still waiting to understand how the Shade knew about Barry's alt-continuity past for instance). That Iris should be the one to finally remember some of the older, absent Flash family is a nice touch, and the book's final page is a great tease for what comes next. I thought it particularly interesting that Wally remembers the original (New) Teen Titans here, with Cyborg and Beast Boy, which would make for an awkward next Titans meeting were "No Justice" not already causing that team problems. Whether Flash Vol. 7: Perfect Storm was quite necessary to bridge the first six volumes of this book and "Flash War," I'm not quite sure. I've been impatient for Joshua Williamson to get on with it for a while, and after the "Flash War Prelude" annual collected in Flash Vol. 6: Cold Day in Hell, it really seemed like we were about there; at the least, Perfect Storm might've benefited from one fewer issue, one less "Grodd's got the upper hand/no, he doesn't/yes, he does" reversal. But artists including Carmine Di Giandomeico and Christian Duce offer an attractive, eminently readable book, and the next one (due in December) can't get here fast enough. It's make or break time for the Flash series. I really do not care for godspeed, and I hate the rather lackluster attempt at reforming him. ALso, this barry angst represents a problem that DC comics has ahd for the last few years. According to Dan Didio, heroes are not meant to be happy or positive.They must be dark, brooding and miserable. The portrayal of Allen is another fine example of Dan taking the joy away and replacing it with darkness, because he thinks every superhero in DC comics should be bloody batman!! The sooner this nonsense is stopped, the better.